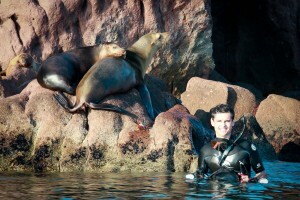 Born in Guadalajara, Mexico in 1976, Alejandro is a veterinarian and zootechnist engineer. He has been attracted to animals and nature for as long as he can remember. His love towards animals is attributed by Alejandro to an early childhood encounter with a circus elephant which he was absorbedly observing while it sucked his whole arm to the shock of his mother. Far from traumatic, this experience was fascinating for him. His photographic journey began around 2007 when he simply found out how to combine his passion for all animal life with his eye for natural beauty. "I think there are three important qualities a wildlife photographer needs to have: patience, creativity and persistence" he says, "this attributes combined with studying and observing animal behavior are determinant in wildlife photography." Alejandro's goal is to transmit through the lens what he sees and feels provoking the same emotions to the viewers, so maybe they start looking at nature with a different light; encouraging a strong impulse for Conservation. Alejandro Prieto was commended in the Cold-Blooded Animals category in the prestigious 2013 Wildlife Photographer of the Year contest for his image "Cold-Blooded Killing".